***Unless otherwise indicated all art, images, sounds and music are original compositions ©copyright 2012-2018 Larry Ware and WareEver Productions. Any unauthorized use is strictly prohibited and subject to prosecution under penalty of law. WareEver Productions is a freelance still photo, video and sound enterprise, located in a quaint, quiet and rural area between Charlottesville and Richmond, Virginia. The charms of still photography first captured my attention during the early days of my college years resulting in the purchase of a used Pentax 35mm SLR film camera. I began snapping images of friends and family as a hobby. Serious interest developed slowly and became more than a passing fancy after marriage and fatherhood. Children make some of the most challenging and rewarding photographic subjects. It is still a central focus of my photography and video. If I had to choose a single specialty, children and family would be nestled near the top of my list. My interests also include human and animal portraits, landscapes, unusual buildings and structures, new and antiquated vehicles, and so on. I embrace the challenge of capturing a story which becomes embedded in a photo. My venture into quality motion capture began years prior to the current productions in high definition which has now become the standard of the industry. I began working with higher resolution formats before any of the major networks broadcast in this medium. Besides family events and archival projects, my early filming experiences were recording sermons, church forums and seminars. My formal intro to high definition was punctuated by several weddings for family and friends in which I filmed Hi Def and output to both standard DVD and Blu-ray disk mediums. Prior to videoing, I acquired Pro Tools and developed the skills to create high quality audio recordings. My interest in music and audio has led me to record and mix musical selections for local musicians. These experiences have given me a proficiency in producing video sequences that would be dull without good audio. I invite you to view recent Video Samples produced by WareEver Productions. A forum for the St. James's Episcopal Church was captured on multiple Hi Def cameras. PowerPoint slides were incorporated into the video during post production with excellent results. Upon completion, the final file was prepared in HD and posted on YouTube. Since then I have produced numerous PowerPoint videos posted on YouTube including a multi-part series. I completed a 2013 project with Bract Retaining Walls and Excavating, LLC in which I combined sequenced time lapse photos with motion video. The Video records the construction of the retaining wall at the new practice center for the Washington Redskins in Richmond, Virginia. Since I embrace both mediums of photography and video, time lapse doubles the pleasure--combining the two. The bottom line. 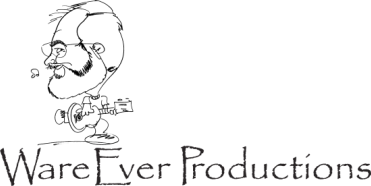 . . if you have a project which requires photography and/or quality video, I invite you to consider WareEver Productions. My objective is to give you the best service, furnishing quality still, motion and sound, preserving the important memories and events of your life to be enjoyed for years to come.